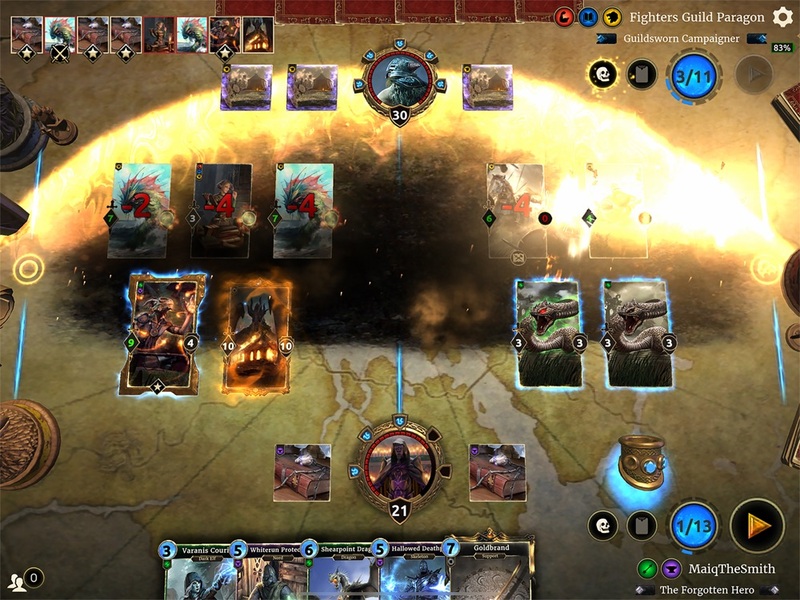 The Elder Scrolls: Legends is an award-winning free-to-play strategy card game. 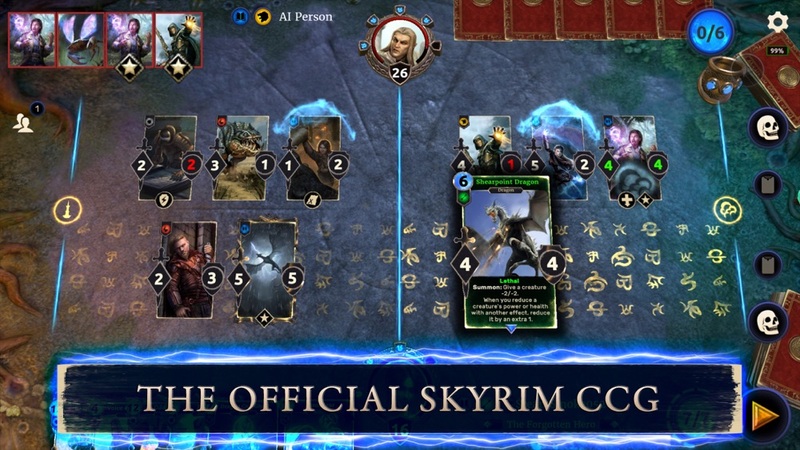 Enter an online CCG based on the hit Elder Scrolls RPG series and prepare your deck for battle! Journey through THE Elder Scrolls stories, conquer your enemies, and join the fun in this easy-to-pick-up, hard-to-put-down adventure! 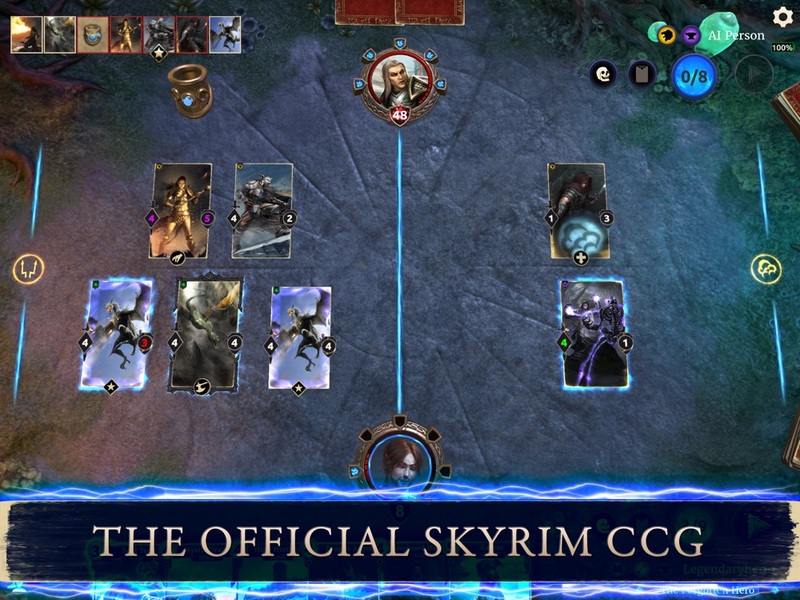 Gather cards and build your deck, then travel through Morrowind, battle dragons in Skyrim and venture to the Clockwork City. Experience an Elder Scrolls adventure that keeps on growing. 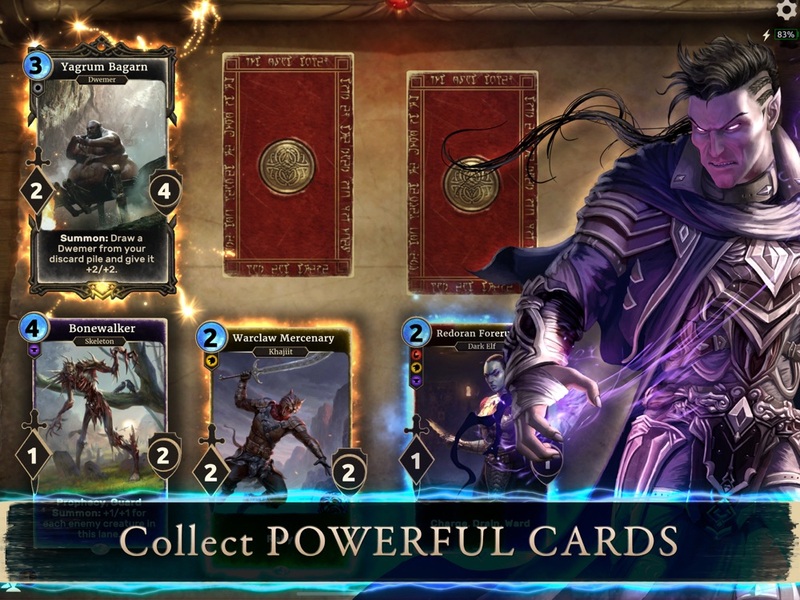 Whether you have 10 minutes or five hours, The Elder Scrolls: Legends will take you on an epic CCG journey. - Do you like playing solo games? Legends has you covered. - Learn the basics of Legends and experience hours of solo gameplay while earning rewards along the way. - Delve into expansive three-arc stories spanning Elder Scrolls tales of The Dark Brotherhood to the fabled Clockwork City and more. 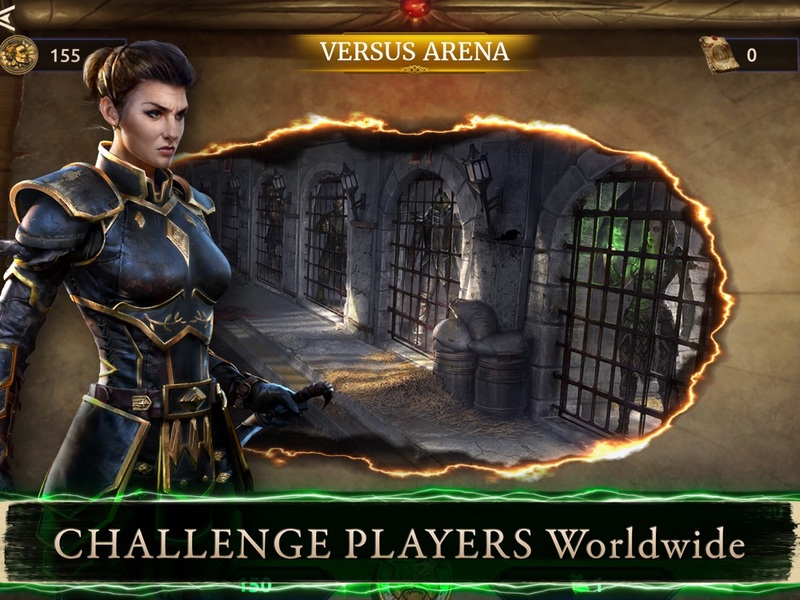 - Jump into Solo Arena to test your deck-building skills or wrack your brain in one-off Puzzle challenges. - A strategic card game unlike any other, Legends features a divided battlefield with “lanes” that allow for flexibility and choice, turning the simple act of card placement into a tactical strategy. - Think you’re down and out in a match? With Runes and Prophecies, every losing battle is a chance for a miraculous comeback with an additional card draw when you need it most. - Harness the power of your decks and battle against other players for ultimate bragging rights and rewards. - Step into the Gauntlet, a global weekend tournament with online duels pitting players from all over the world against each other. - Show off your personality with cosmetic card backs and unique titles to flaunt your victories and achievements to friends and foes alike. - Past expansions include: Fall of the Dark Brotherhood, Heroes of Skyrim, Return to Clockwork City and Houses of Morrowind. Gather your cards and prepare for battle in Elder Scrolls: Legends! Download now. 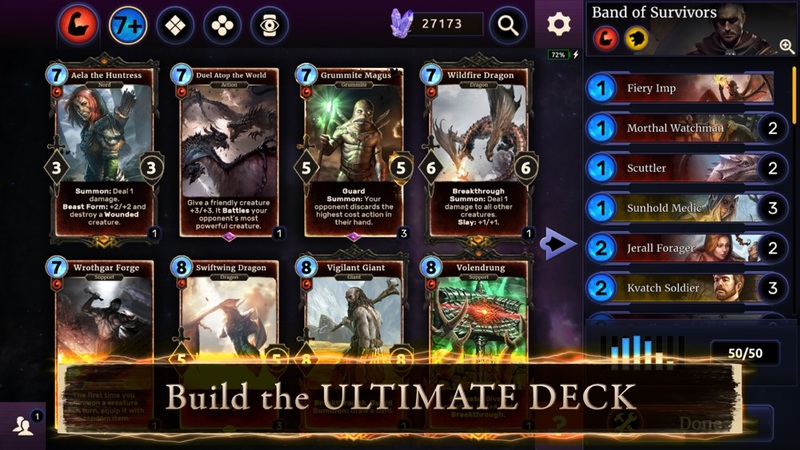 Fixed an issue on mobile platforms that was forcing the app to re-download asset bundles that it did not need to, during gameplay, causing blank card art, slow performance, and soft locks. 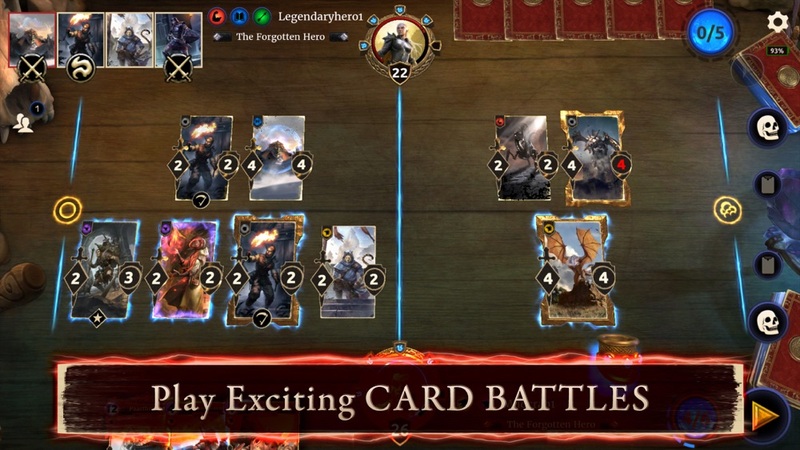 The latest version of The Elder Scrolls: Legends is live! Check out the new Quality of Life feature, our cute new FX for Mudcrab Anklesnapper, and over 100 fixes! 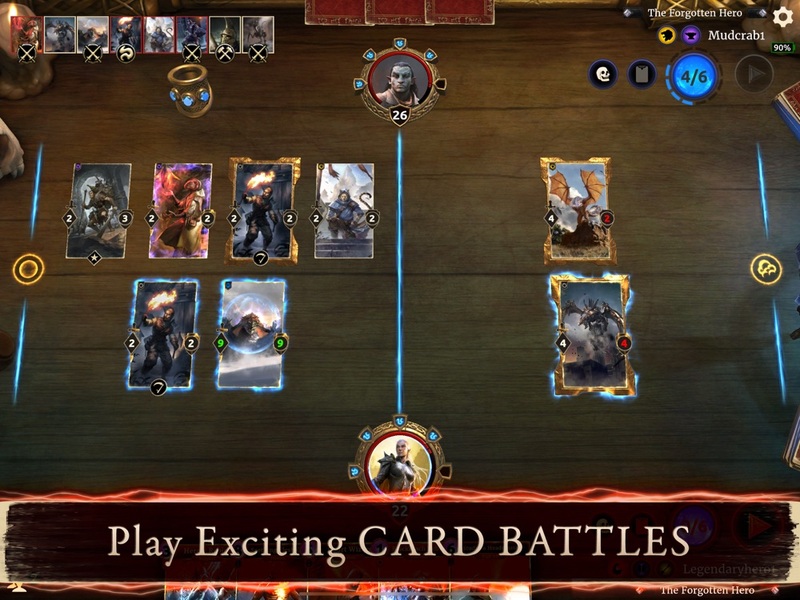 The latest version of The Elder Scrolls: Legends is live! Big memory optimization for min-spec mobile devices, plus a small set of quick fixes for bugs found after the release of Isle of Madness. • New Card Type – Double Cards"
Isle of Madness Pre-orders Now Available. Visit the store to pre-order and receive bonus content when Isle of Madness launches for Legends! The Festival of Madness is underway! Log in every day to take advantage of a unique, one-day-only sale. Sheogorath has kicked off the Festival of Madness, offering up exclusive sales every day for a limited time! Each day, the Daedric Prince of Madness himself will offer up a special item to purchase in the store for a discounted price. You’ll have to act fast, however - Sheogorath is a fickle deity and each of his deals only lasts for 24 hours! Be sure to check in every day to see what’s available during the Festival of Madness, and visit legends.bethesda.net to learn more! 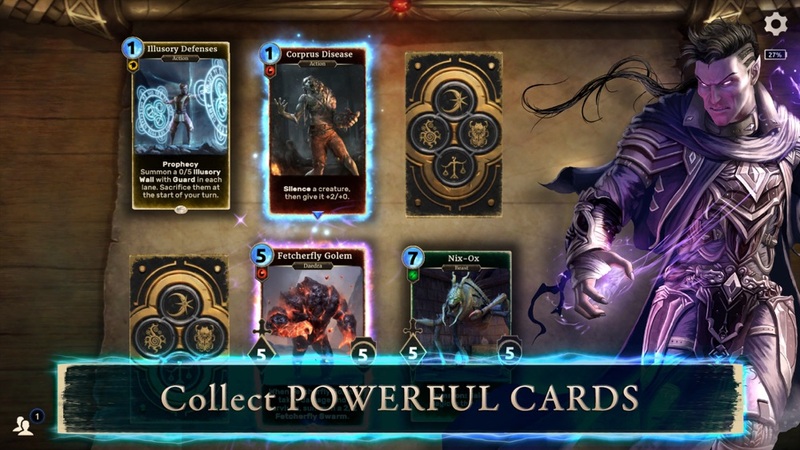 Introducing the FrostSpark Collection – a promotional set of all-new cards for The Elder Scrolls: Legends! These featured cards augment a wide variety of deck archetypes with interesting and unusual game interactions. The FrostSpark Collection features playsets of 11 exciting cards. Please visit legends.bethesda.net for a full list of bug fixes and gameplay improvements. * Accounts with special characters in their names and/or passwords are now able to sign in. * Moving cards during gameplay while playing over slower internet connections will now be smoother and more reliable. * Players will experience fewer delays while downloading over slower internet connections. * Packs rewarded for registering your account are now delivered immediately. * Almalexia’s Disciple now properly displays the healing done by its Exalt effect. * Ayrenn’s effect no longer causes cards drawn to appear blank while moving into your hand. * Excavate now enables Supports drawn with it to be played normally. * Orvas’ Bargain now properly affects both the enemy and friendly creatures chosen. * Raise Dead now properly summons two creatures to one lane if only one lane is available. * Staff of Sparks has been restored to its proper Legendary rarity, and its effect no longer causes an issue when its wielder attacks a creature with 1 Health. * Tullius’ Conscription no longer sends cards to the graveyard if they can’t be placed in a lane. * Silence effects now work properly on the keyword abilities of Custom Fabricants created by Fabricate. * The Spawning Pool scenario in Solo Arena now spawns Slaughterfish properly. * Solo Arena matches will no longer feature two identical lane conditions. * Story and Puzzle chapters no longer intermittently cause the game to become unresponsive. * In Story modes set to Master difficulty, editing your deck will no longer change the difficulty to Normal. * In The Fall of the Dark Brotherhood Episode 5: The Skooma Den, players will no longer receive 6 starting Magicka. * In Return to Clockwork City Episode 5: Furnace Depths, Collapsing Tunnel’s effect will now properly occur on each rune break. * In Return to Clockwork City Episode 6: Return to The Inner Curiosity, the disc for selecting the chapter will now appear immediately on unlock, and the ability to unlock both endings through replay has been restored. * Ancano’s English-language voice has been restored. * Innkeeper Delphine and Grandmaster Delphine attack sounds have been restored. * Priest of the Eight sounds have been restored. * Solitude Stalwart sounds have been restored. * Aldora the Daring, Arcanaeum Librarian, Back Alley Rogue, Cog Collector, Penitus Oculatus Agent, Ratway Prospector, Relic Hunter, Ruthless Freebooter, Sails-Through Storms, and Scroll Seeker localized-language sounds have all been restored. * Volume has been normalized during multiple Shackle effects occurring at once. * Sounds of opponent discs stacking in Arena have been restored. * The Arena announcer will now properly announce lane conditions. 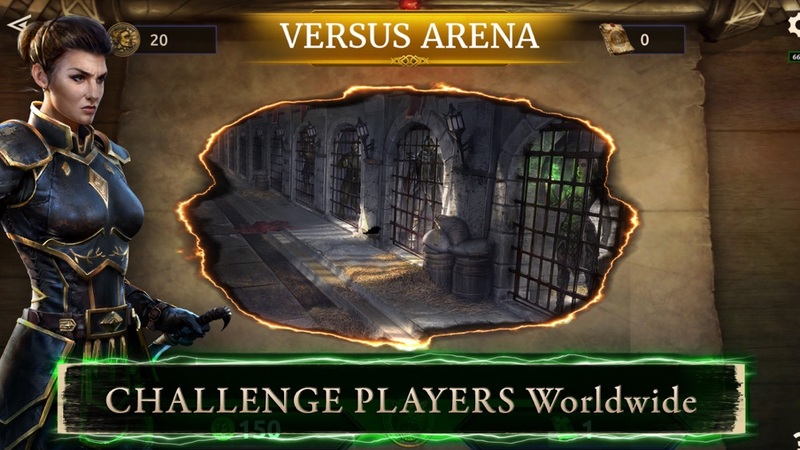 * The Arena announcer will no longer repeat your previous result when a new Arena begins. * “Legend” rank now displays properly throughout the game and will no longer obscure cards in hand. Ranked matches affect your Legend rank again. 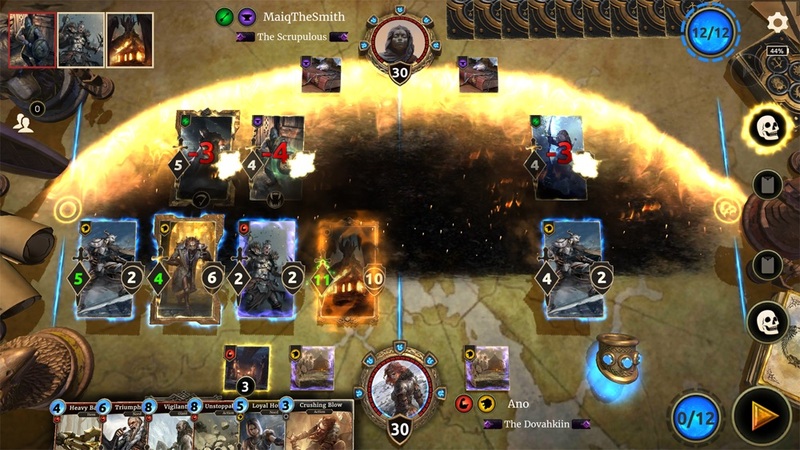 * Close Call, Crystal Tower Crafter, Imperial Might, Indoril Archmage, Laaneth (Return to Clockwork City alternate art), and Stonehill Mammoth have had their premium versions restored. * Altar of Despair, Assembled Titan, Balmora Spymaster, Barded Guar, Betty Netch, Cicero the Betrayer, Fighters Guild Recruit, Hand of Dagoth, Mechanical Ally, Reachman Marauder, Sanctuary Pet, Disciple of Namira, and War Cry have updated premium versions. * After attacking, creatures that survive now return to position more smoothly. * Supports now properly display their “Ongoing” or “Uses” bars in Collection view and in hand. * The attributes of Supports are now properly displayed while in play. * Prompts for summon abilities are now displayed larger. * Cards are now displayed larger while recruiting an Arena deck on mobile devices. * Featured Items buttons now link directly to the item shown. * Video settings on Android and iOS are now set automatically. * Many other small fixes have been made. Localized patch notes for all supported languages will be added on Sept 24th when we go live with this build. ●Starting with this patch, when you reach Legend on the Versus ladder, you’ll receive the new Legend Card Back when you get your monthly rewards. ●Mobile users can once again initiate Friend Challenges. ●When an action with Betray fills your lanes by summoning one or more creatures (such as Fleeting Apparition or Divayth’s Experiments), you are now able to Betray and play it again. ●User interface for Apple iPhone X has been improved. ●Morrowind packs are the default for users when they go to the packs screen for the first time (new players will still see Core packs). ●All users are now able to use the Soul Trap Extras button. Previously, the number of decks you could have at one time in the Deckbuilder was limited to 35. That has been expanded to 50 decks. •Balmora Spymaster no longer gives negative stats and costs to some cards (such as Ancient Giant). •Embassy Disguise no longer gives Cover to a Guard. •Time is Running Out! has improved wording in non-English languages. •The ongoing Skeleton buff from Bone Colossus is now properly removed when the Colossus leaves play. •Gauntlet Leaderboard timer properly displays GAUNTLET ENDED when time runs out. To commemorate our very own Forgotten Hero of Tamriel, we have 12 exclusive new cards. You’ll receive a full playset of each, and a wide variety of exciting cards to shake up your decks. Bling up your deck! Special card backs are now available so you can fill your opponents with envy. When you mouse over your deck on the playmat, you’ll now also get a count of your Cards In Hand. It’s easier to see if you’re going to lose a draw due to overflow. Now Available: New Life Festival Packs feature 10 packs of the Core set, 10 packs of Heroes of Skyrim & playsets of 3 exclusive (and all new) premium alternate art cards: Leaflurker, Master of Arms, and the mighty Alduin!! 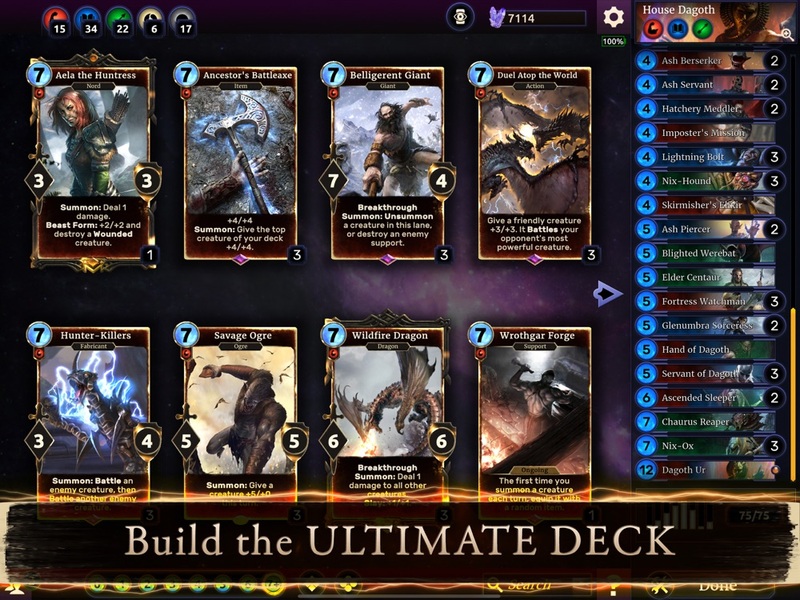 Cards changed in our latest update include Hist Grove, Thieves Guild Recruit, Thorn Histmage, Ulfric's Housecarl, Northwind Oupost, and yes, Unstopable Rage. Millennia ago, the tinkerer god Sotha Sil built himself a hidden sanctuary, from which to shape his vision of the future. He called it the Clockwork City, and it was there that he died, when a fellow god betrayed and murdered him. What secrets died with him? What was he building in those gleaming halls? In the centuries since, no mortal has entered the city. Until now. In Return to Clockwork City, collect full playsets of 58 new cards by playing through 35 exciting story missions across three acts. With these cards, you can search for lost treasure, construct steam-powered wonders, or channel your inner mad scientist to create strange mechanical abominations. Completing the story on Master difficulty will also award the player with an exclusive premium alternate art copy of Swims-at-Night. - Triple Bundle: Get all three acts and all the new Return to Clockwork City content for $19.99, plus an exclusive premium alternate art version of Laaneth. - Single Acts: Play through the first act for $7.99 or 1,000 in-game Gold. After you complete the first act, the second and third acts become available for purchase for the same price. - Twitch drop messages will now appear in your Notification Tray. - Soulrest Marshal - Hinting now functions properly on premium version. - Elusive Schemer - A 0-cost Elusive Schemer now copies correctly as another 0-cost. - Spear of Embers - Now properly applies keywords to damage done when thrown. - Brutal Ashlander - Now properly deals damage after potential targets are destroyed. - Eastmarch Crusader - Now properly hints when a single rune is destroyed. - Practice Mode - Adept and Expert levels now correctly unlock one at a time. - iPhone X - Several buttons have been moved to accommodate this device’s aspect ratio. - Versus Arena - Event descriptions now read correctly on phone and tablet clients. - Social - Do Not Disturb setting no longer prevents users from being removed or blocked. - Beast Form - A creature transformed with Wabbajack into a Beast Form creature can no longer attack on the same turn when their Beast Form ability triggers. - Phone - Users can now properly cancel the play of a non-targetable action card. - Error Codes - Information given to the user when an error occurs has been improved. - Play History - Now remembered after a reconnect. - Ranked - Users can now properly progress past the ranked progress screen by clicking on it. Hello Hero: Epic Battle Fincon Co., Ltd.
老子有錢 Xiang Shang Games Co., Ltd.